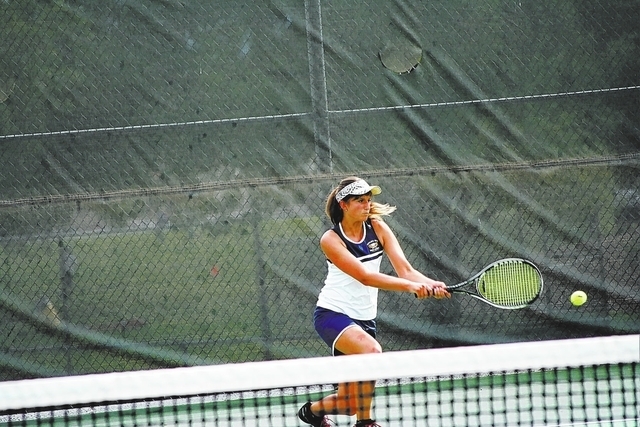 If Boulder City junior Melissa O’Berto had her way it would be tennis, everyone. “I love tennis so much,” said O’Berto, currently the Lady Eagles’ No. 1 singles player. “I talk tennis all day and all night. I never shut up about it. I know I drive my friends crazy at times, but I just want to live tennis every day of my life. O’Berto’s zest for the game comes from her parents, both players. Her mom, Sheri, is a former player at University of Nevada, Reno, and her father, John, is a longtime player. O’Berto is at No. 1 singles and senior Taylor Finn and junior Arianne Hess will alternate at No. 2 singles, according to coach Eric Speaker. Last year’s No. 1 player, senior Aiyana Donske, is injured but is expect to return later in the season. O’Berto is in her third year with the Lady Eagles, and she wasn’t going to be out there without some of her close friends. So, she recruited classmates and longtime friends Sariah Gneiting and Alexis LeMaster, both juniors. “We have a very good group of girls, and I think they will have another fine season.” Speaker said. The team’s doubles players will be freshman Natalia Fullmer, junior Madeline Montgomery, freshman Kira Yamamoto and freshman McKenna Frazier. A year ago, the Lady Eagles won the Sunrise League team championship with an 11-1 record. They were the No. 1 seed and defeated Adelson in the Southern Region quarterfinals before having their season end with a 13-5 loss to Faith Lutheran. This season, they are 4-0 after Tuesday’s 16-2 win at Chaparral. O’Berto and Hess went 3-0 in singles play in the victory against the Cowboys (2-2). Although the girls team seems poised to repeat as league champions, the boys team has been unable to field a full team. “The boys we have out there are playing hard, but it is a struggle with a small roster,” Speaker said. Sophomore Gavin Morris has started the season as the Eagles (2-2) No. 1 singles player, while senior Facio Gomez plays No. 2 singles. The doubles players are sophomore Tyler Lyon, junior Eric Gros and freshman Charles McCallum and sophomore Jacob Harrison. Because the boys’ team does not have the full number of players, it begins each match by forfeiting six points. Eighteen points can be earned, but the first team to 10 points wins the match. Last season, the boys’ team finished in fourth place in the league and advanced to the Southern Region tournament. 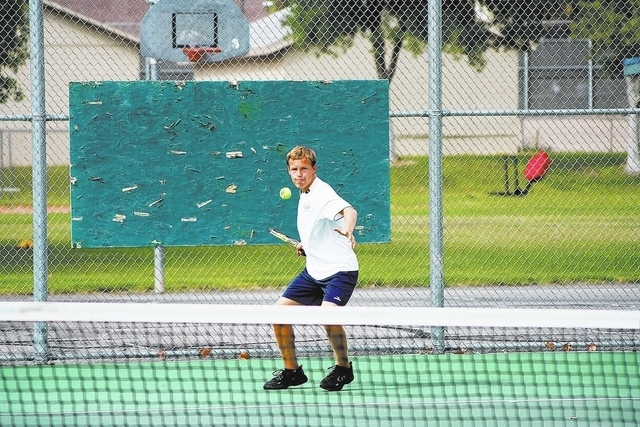 They lost to top-seed Clark, 15-3, in the first round. The Chargers went on to win the state championship with an 18-1 record. Team captain Gros said the team expects to do well despite the small numbers. On Tuesday, the Eagles had their worst outing of the season so far Tuesday at Chaparral (3-1), losing 16-1. The Boulder City teams have a busy week ahead with a match today in Mesquite against Virgin Valley and a match at home tomorrow against Moapa Valley. They also play at home Monday against Tech, and travel to play at Sunrise Mountain on Tuesday. All matches are at 3 p.m. The Virgin Valley’s girl’s team is also 4-0, the only other unbeaten 1-A girls team in Southern Nevada. Reporter Pedro F. Fonteboa can be reached at fonteboavegas@yahoo.com. Follow us on Twitter: @BCReview.